The house of Perrier-Jouët has certainly been keeping itself busy this Spring; the French champagne marque has announced London-based ceramicist Hitomi Hosono as the winner of the inaugural Perrier-Jouët Arts Salon Prize. The brand new contemporary craft award, officiated by a panel of thirteen judges, stems from Perrier-Jouët’s longstanding patronage of the arts, particularly its affinity towards the Art Nouveau movement. Perrier-Jouët’s contemporary incarnation of the Parisian art salons from the 1700s will see a biannual meeting of the UK’s foremost creative minds and influencers. The founding members of the Perrier Jouët Arts Salon include milliner Stephen Jones, artist Kate MccGwire, product designer Tord Boonjte along with our own Editor-in-Chief Tony Chambers, who came together to select Hosono from a shortlist of 12 nominees. The ceramicist edged out Giles Miller and Fabien Cappello among others to scoop a £10,000 grant to develop her career as well as a solo exhibition of her current work, which will open by appointment to the public at the St Pancras Renaissance Hotel Chambers Club this coming summer. Svelte and feminine in form, Hosono’s intricate ceramic pieces are inspired by botanical studies in her own garden as well as her recollection of landscape during her upbringing in Japan. The prize similarly coincided with the unveiling of ‘The Enchanting Tree’ at London’s Saatchi Gallery. 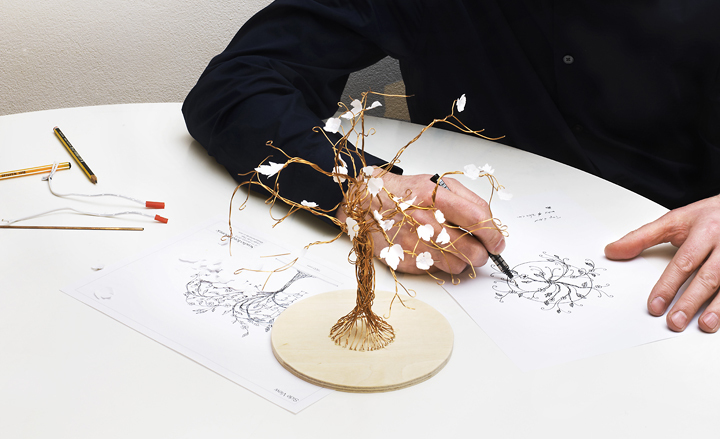 Salon Arts member Boonjte created the bespoke art installation as a life-size version to accompany an limited-edition champagne flute tree for the bran. The large-scale artwork has since been moved to Perrier-Jouët’s mansion in Epernay, which houses the largest private collection of Art Nouveau works in Europe.